The Students Tab will be the default tab you’ll see upon first logging in to your Teacher Menu. Below you will find a table of contents for options in the Students Tab. When you log in, the Students Tab in your Teacher Menu will look like the menu below. The blue bar at the top will display your school code, the maximum number of student accounts allowed on your code, the current number of accounts in use, and the total number of accounts available. To add students to your class that have already been enrolled to your school license, click the Add Enrolled button in the top row of your Students Tab. You will be directed to the Add Enrolled Menu. 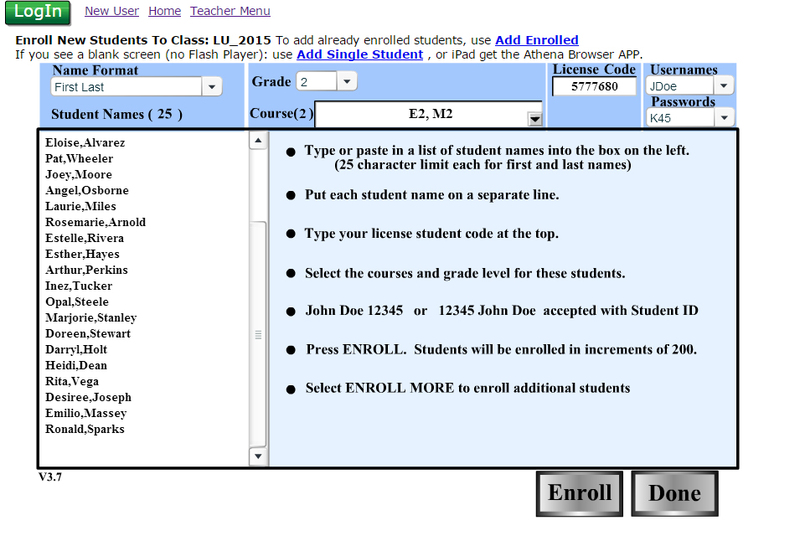 In the Add Enrolled Menu you will see two columns, your Current Class will display on the left and the school roster will display on the right. Click the Add button for the students you would like to add to you Current Class. You can filter the school roster list by searching by first name, last name, student ID, or grade level. To add new student accounts with courses to your class and school license, click on the Add New button in the Students Tab of the Teacher Menu. The first thing to select is the Name Format for your Student Names. The default for Name Format is ‘First Last’. 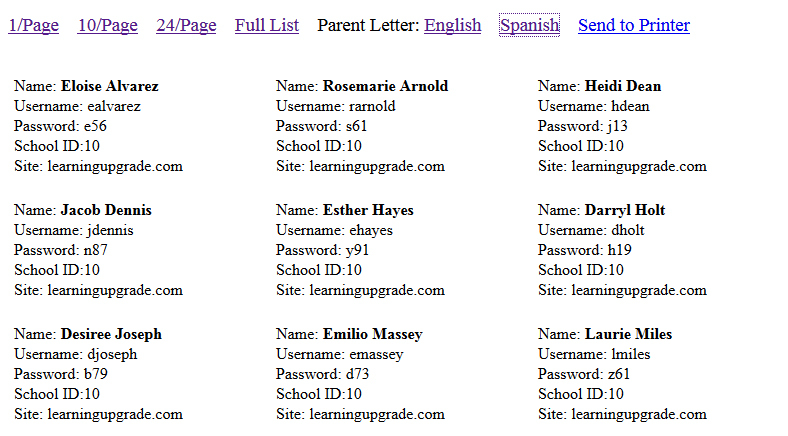 With the drop down menu you can select a different format to include school IDs, custom usernames, and custom passwords. You can copy and paste this information from an excel spreadsheet into the Student Names field box or type them in. The second thing to select is the Grade. The third thing to select is the Course offering for you class. Use the drop down to select one or more courses to be added to your student accounts. The License Code will be populated automatically for you, if it does not, refer to your PDF license code sheet. The final step is to choose the Usernames and Passwords naming convention for your student accounts if you did not import them in the Student Names section. The default username convention is JDoe, which creates a username of first initial and last name for each student. The default password convention is K45, which creates a password of one letter and two numbers for each student. When you are finished selecting all of the options on the student import page, click Enroll. Teacher Whiteboard courses enable a teacher to present the lessons from our courses to a whole class using an interactive whiteboard or data projector. To add a Teacher Whiteboard course to your account, click on Add Teacher. In the menu to Add a Teacher Whiteboard Course, you can select your desire course. Your Teacher License Code and Teacher Name will be populated automatically for you. Click Add Teacher Whiteboard Course to complete the process. You will now see your Teacher Whiteboard course displaying above your student’s accounts in the Student Tab. To launch your Whiteboard course, click on the course name in the Start Courses column. You can also add additional courses by clicking Add Course in the Add Course column. To print your student’s usernames and passwords, click the Print Passwords button in the Student Tab of the Teacher Menu. At the top of the screen you’ll see options to select how many students to be displayed on each screen. You’ll also see options to print a Parent Letter in English and Spanish. To track your entire class in real time, click the Student Monitor button in the Students Tab of the Teacher Menu. This graphical report shows each student and the “medal” for each lesson completed in each course. Since there is a green triangle on every level completed “today”, you can find out if any students are not completing levels. The certificate buttons on the right enable you to print certificates for students. 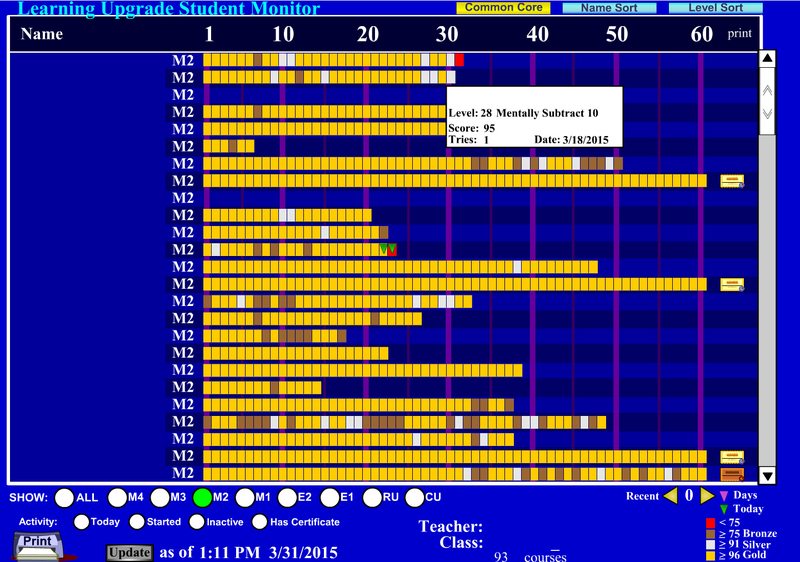 The monitor updates every 5 minutes, or you can press Update to refresh student progress. 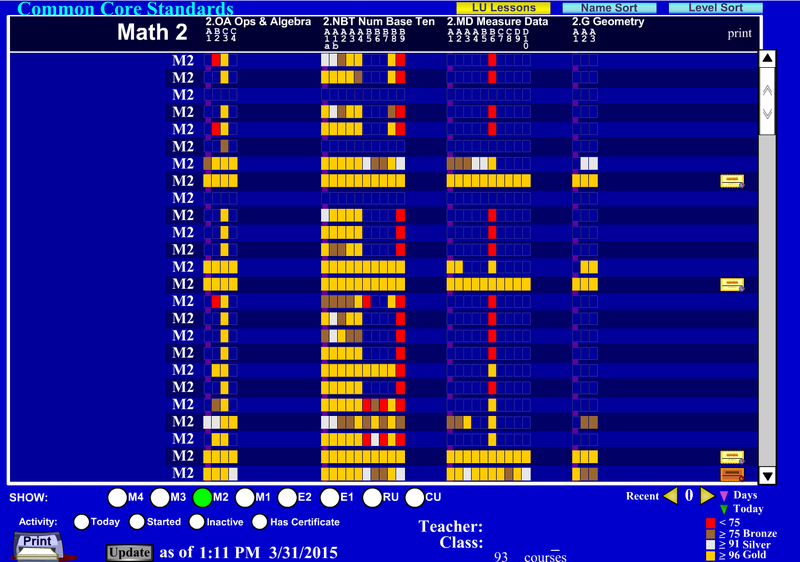 Hover over each “medal” tile to view more data on that lesson. Click on a course circle at the bottom next to Show to filter by course. You can also view your Student Monitor organized by Common Core Standards. Just click the Common Core button at the top of the screen. If your students are too young to remember a username and password, you can use the quickstart Student Menu by clicking the Student Menu button in the Students Tab. This will require you to log in to your own personal teacher account and launch the Student Menu on each computer. Students can now find their name and click Start to being using their course. If you need to edit any of the information on a student account, click Edit next to the student’s name in the Students Tab of the Teacher Menu. In the Edit Student Menu you can change a students name, username, password, student ID, and grade level. You can also add their first language and if they’re special needs. Once you’ve made your desired edits, click Update Student to finalize the changes. 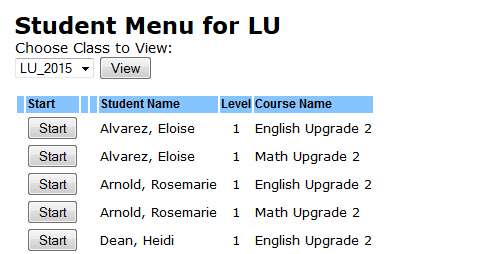 If you would like to add an additional course to a student account, click Add Course in the Add Course column. Select the desired course in the ‘Enroll Student in a Course’ menu and click Enroll in Course. To remove a student from your school license, click on Remove in the License column in your Students Tab. *Note: this will remove the student entirely from the school account, including other teacher accounts. To remove a student from your class, click on Remove in the Class column in your Students Tab. *Note: This will only remove the student from your class and will not remove them from the school license or other teacher’s classes.